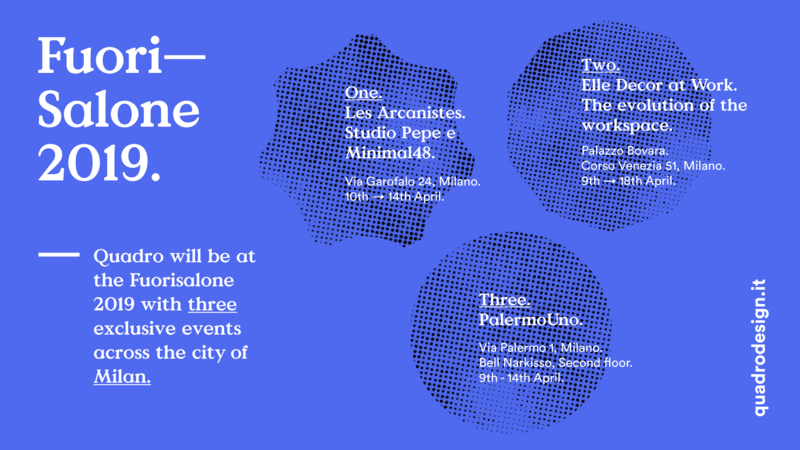 Milan design week 2019 Salone dei Mobile – Quadro Design, presents collections of kitchen and bathroom faucets in three out of the ordinary concepts! 9 – 18 April Elle Decor at work. The evolution of the workspace . Exhibition installation at Palazzo Bovara, Corso Venezia 51. Hours: 8 April from 15.00 to 20.00, from 9 to 18 April from 10.00 to 20.00 and 12 April from 10.00 to 17.00 . 9 – 14 April PalermoUno is renewed, via Palermo 1. Schedules: from 10.00 to 20.00. 10 – 14 April Les Arcanistes, The future is a new written project by Studiopepe in which Minimal48 participates as a design partner, via Garofalo 24. Hours: 9 and 14 April from 11.00 to 18.00, 10-13 April from 11.00 to 20:00.